Maggie Muggins Designs: Celebrating Forever with My Love! Friend: "What is the temple all about anyway? I mean, it's like a castle, so pretty, but what do you do there?" Me: "Well, one of my favorite parts about the temple is that we perform marriages there. It's not like a normal civil marriage, the couple is married for eternity not just time. We believe that we live forever so it only makes sense to be married to the one you love for eternity." At this point her phone rang and the conversation ended (we were working at a call center). I'll admit her reply had me surprised. Most people don't know how to respond when I tell them about temple marriage. They are shocked by the idea of being married forever. For them, just being married for this life is a long time. So when she thought it was romantic I was really intrigued as to why. I had never connected temple marriage and romance together. I'm not sure why - but she's right. It is romantic. 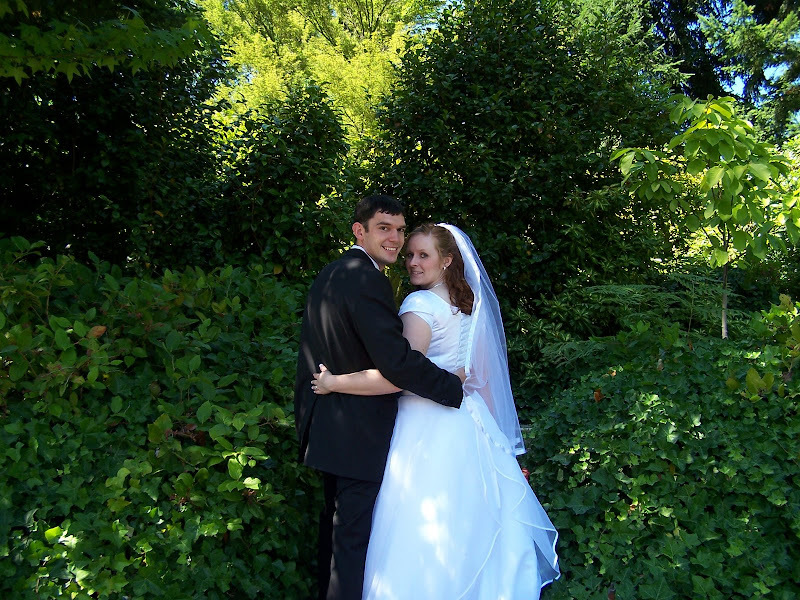 When I married my husband August 20, 2005 in the Seattle Temple it was such a wonderful experience. What made it even better was knowing that he was going to be with me for eternity! 3 years have gone by - and quickly. I can't believe how fast it's gone. I'm so glad we have forever together or I'd seriously be panicking about not having enough time in this life. My husband is my best friend, he's my greatest support, and he is the most wonderful man I know. Not only that, but he is an awesome father too. Who could ask for more? Being married for eternity helps us to have a different perspective on our marriage. We don't want to get out, we want to make each other happy and we work hard to make our marriage better. So when 3 years have gone by and I can say I love my husband more than ever it makes me so happy! It sure helps to know he feels the same way. Here's to us love, and our eternity together! Obviously you two are still "head over heels" in your happily ever after :) What a perfect start to your story! Congratulations on the happy happy day!! !